Basic forms of lobbying have actually existed since the 1640s, when the House of Commons allowed the public to appeal to Representatives in the lobby of the legislature building. This practice (carried over from England), borne from the people’s right to petition elected officials, was seen as critical to American liberties and rights. Thus, our forefathers included this right to petition in the First Amendment of our U.S. Constitution. The idea of a government “by the people, for the people” has guided this country’s approach to lawmaking for centuries. Our nation fought for independence from a ruler who most colonists felt did not have their best interests at heart and ignored their concerns. When the United States arose victorious from the revolution in the late 18th century, those colonists asserted their new independence by voicing their needs and opinions to community leaders and lawmakers. Thus, an early form of lobbying was born. 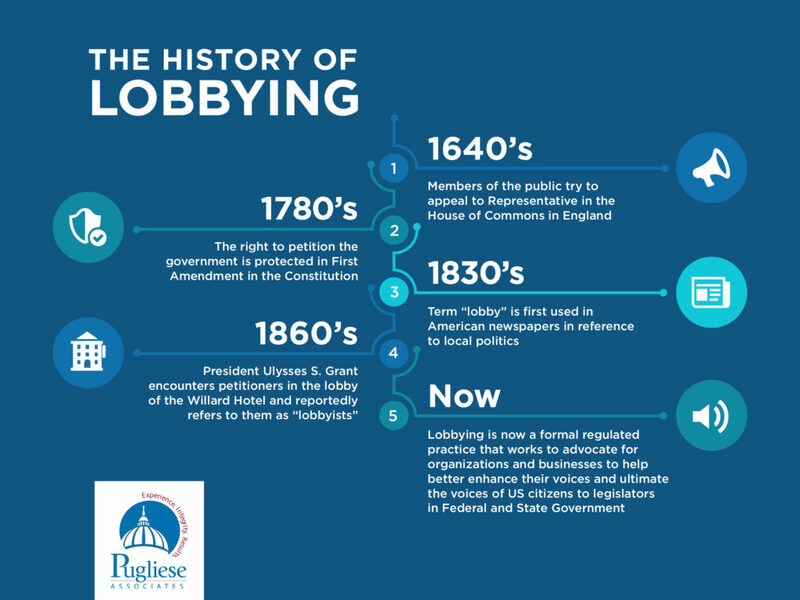 A few decades after early forms of soliciting legislators on issues began between citizens, business owners, and lawmakers, the actual term “lobby” first sprung up in Ohio in reference to the practice. By the 1840s, the term “lobbying” started to appear in newspapers. The term itself gained popularity (and perhaps is still best remembered) when consequently Ulysses S. Grant began referring to the people who tried to petition him as he enjoyed a cigar in the lobby of the Willard Hotel as “lobbyists”. By the Reconstruction Period, both the word and the practice were gaining momentum as the government grew. Modern day lobbying has transitioned from those 18th century meetings between farmers and lawmakers, to the conversations in the lobbies of hotels, into what it is now – a formal, regulated practice that provides an influential way for voices and opinions to be heard in state capitols across the nation, including Pennsylvania. WHO….. is represented by PA lobbyists in the 21st century? WHAT….. defines state lobbying today? State lobbying is one of several methods used by individuals or groups to get lawmakers in Pennsylvania to consider different ideas and outlooks. Often PA lobbyists work on behalf of those whose views might not otherwise be heard. At its core, lobbying lifts up people’s voices to ensure that elected officials hear, listen, and give consideration to perspectives that they might not otherwise consider. WHY….. is state lobbying still necessary? Legislating is complex work. One may not realize just how positively impactful lobbying firms can be for the greater good. Lobbyists in PA regularly inform legislators and legislative staff on the ever-changing landscape of issues and their effect on businesses and individuals in PA. Lawmakers consider hundreds of regulations each year and may not be fully aware of the nuances of each regulation’s effect on constituents or businesses. Most issues are layered in complexities that must be first known before they can be considered. Lobbyists help lawmakers by informing them more completely on issues so that constituent interests are understood and all consequences of decisions made (intended and unintended) are weighed carefully. HOW…. do lobbyists in PA help clients? Just as legislators are assisted by lobbyists in information gathering, clients and businesses also need to understand the government processes, strategies, and direction. A top Pennsylvania lobbying firm, such as Pugliese Associates, helps clients to stay informed and an experienced PA lobbyist helps clients message to legislators in a manner that will resonate. They also educate clients on how and when to approach lawmakers on their interests. Lobbyists support their clients’ perspectives with data, economic impact reporting, and facts appropriately with political climate in mind. A good PA lobbyist is highly educated on the issues that impact clients. He or she must be persuasive and keenly aware of other factors that might influence the outcomes they seek. Ultimately, PA lobbyists are a conduit between businesses, private entities, nonprofits, and lawmakers. Lobbyists in PA work to understand and communicate how entities and Pennsylvania residents will be impacted by new laws and policies. It is a PA State Legislators job to satisfy constituents by representing their interests. A top PA Lobbying firm, such as Pugliese Associates, realizes everything that goes into a legislator’s need to serve the people as well as promote business so the communities and residents they represent thrive. It is in this capacity that Pugliese Associates is able to achieve results for clients. WHERE… does this lobbying take place now? On any given session day, one can see PA lobbyists in the “lobby” of the Capitol. Although Pugliese Associates lobbyists do mill around within the inside entrance of the Capitol, if you were to follow any one of our lobbyists for a day (bring your running shoes) because you would have to follow us into the Senate Rules Room (where many of the off the floor meetings are held), into individual legislative offices to discuss a myriad of issues; into the House Majority Caucus and Appropriations Committee meeting rooms taking notes on moving legislation; or into the Governor’s Offices, speaking to folks within the Administration. Pennsylvania lobbying firms like Pugliese Associates are advocates for their clients. PA Lobbyists are the eyes and ears of the legislative process, and they keep legislators informed along the way. A good PA lobbyist focuses on strong, solid and respected relationships. A top lobbying firm has years of experience and has built trust over time. In order to effect change, lawmakers must trust and respect top lobbyists as advisors and educators. A reputation that demonstrates good faith and one that can be counted on for candor and integrity is key. An experienced PA lobbying firm that puts time and effort into advocating a position serves many beyond its client base. Perhaps now, it is easier to understand why lobbying has become an integral part of the system of government in the modern world, and specifically how it works to the benefit of citizens and residents here in PA. From its humble beginnings to its present-day development, it is clear that lobbying is a means of petitioning the government “by the people (be they individuals or businesses), for the people”. At Pugliese Associates, experienced PA lobbyists are motivated to continue our mission of providing smart, integrity-driven PA lobbying efforts on behalf of businesses, organizations, corporations, and nonprofits and making a difference in the lives of Pennsylvania residents every day. While you won’t find us at the Willard having a cigar, you will find us in the offices of legislators in the PA State Capitol and around the Capital Complex, working to make a positive impact in Pennsylvania. Call Pugliese Associates today and tell us how we might help resolve your challenges here in PA.